Depending on the timing of the event you are attending, you may be able to hop a bus directly from your neighbourhood to travel to and from the Events Centre. Codiac Transpo has over 20 scheduled routes serving the tri-community. Please visit codiactranspo.ca for a route near you and to see if the timing of the event you are attending fits Codiac’s regular scheduled runs. Another option is to walk, wheel or drive to the main Codiac Transpo Green Line which runs from Plaza along Mountain Road to the Events Centre. For more information on maps and schedules click here. For $2.75 you can catch the bus anywhere along this line on average every 15 minutes pending time of day and will drop you off directly in front of the Events Centre. When leaving, wait for the next scheduled Green Line bus to take you back to where you got on. If you’ve never taken the bus before, try the Google transit trip planning tool… it’s a great way to plan your trip. If you would prefer speaking to someone from Codiac Transpo’s call center, please call 857-2008 week days between 7:30am and 4:30pm and they would be pleased to assist you. If you wanted to drive to the downtown core to park but feel the walk may be a bit much…then the Blue Line is the bus for you. 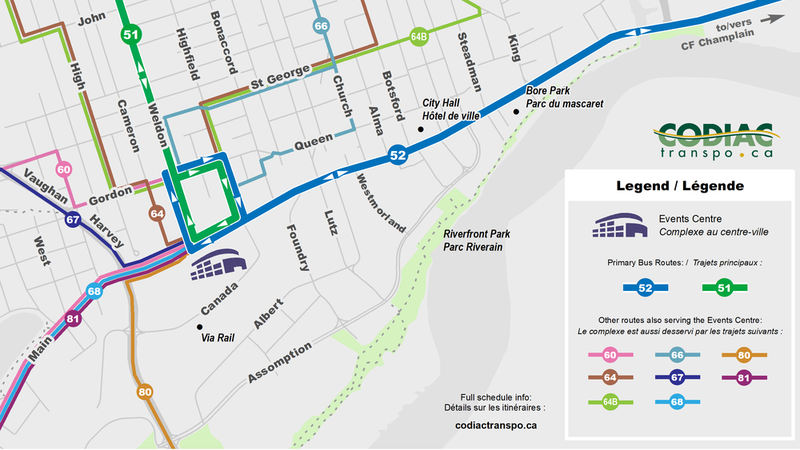 The Blue Line runs along Main Street from the Events Centre to CF Champlain on average every 15 minutes pending time of day. Find a free on-street parking or paid city lot or designated private lots anywhere along the Blue Line, walk a block or two to Main Street and for $2.75/trip Codiac Transpo will drop you off directly in front of the Events Centre. When leaving the Centre, hop on the next scheduled Blue Line bus and get off where you got on to make your way to your vehicle. For large and sold out events, the return ride from the Avenir Centre and 1111 Main will be free after 10 p.m. Check out www.Codiactranspo.ca before your event date for more information on getting to and from the Centre or call 857-2008 week days between 7:30am and 4:30pm for more information.